PASS THE POPCORN! Action Adventure Movies are our feel-good Saturday-matinee favorites. The Action is mixed with a journey to someplace exotic with dangers unknown: Maybe an island shaped like a skull, the desert, or a journey backward or forward in time. Whether set in the past, present, or future, Action Adventure movies take us to places we've only imagined—The trick is getting back alive. My favorite part about Action Adventure is that it usually happens to ordinary people like you and me, and gives us that what-would-you-do element? . . . Run! "Asps, very dangerous—you go first"
into conversation. 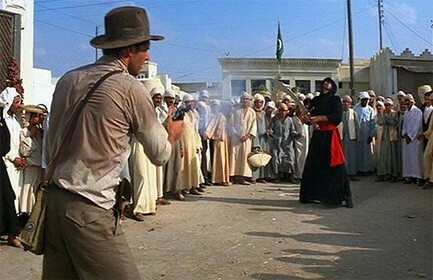 Judging by YouTube, the scene where Indy uses a gun against the guy with the big knife is many people's all-time favorite Action Movie moment. This movie is crazy fun and I will never get tired of it. The pacing is perfect. Everyone in it is really good, but Ronald Lacey stole the show as "Herr Mac" aka Major Arnold Toht. He even has a fan site. "[chortling] Frauline Ravenwood, let me show you . . . what I am used to." There are movies that are so different, they stand out in time and mark a transition. 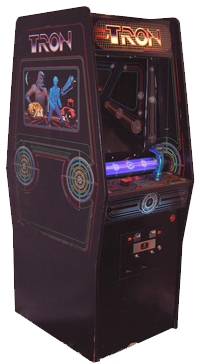 When TRON came out, video game arcades were just springing up everywhere, but California (as usual) was way ahead. Most people didn't use computers in their jobs or everyday lives yet, let alone know what a hacker was. It was beyond cool at the time. The look of the movie and the idea was so different, it's hard to compare to something. It marked a new age we knew was just ahead—A better, more technological future. 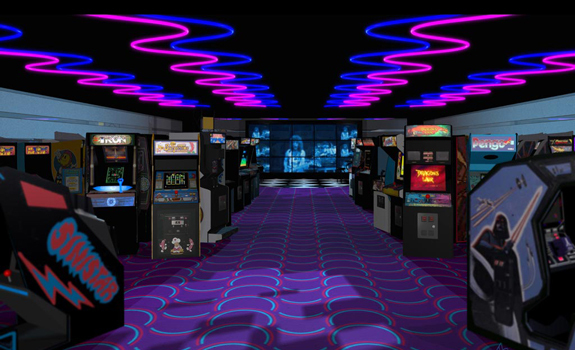 So off we all went to the local video game arcade to blow our paychecks in quarters or tokens and develop "pac wrist" or "pac elbow". But who cared about pain or money?! All that mattered was getting to the next level and beating the high score. 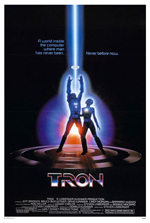 Tron's look was unique and seemed to stand alone until The Matrix and its green code. DINOSAURS! At last! How long did we wait for this movie and how much did we want it?! Kudos to Steven Spielberg for making our childhood movie wish list come to life. When the brontosauruses came on screen, we were right there in the field with the actors, mouths agape. 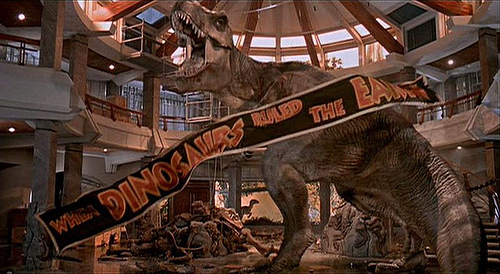 The T-Rex banner-drop scene is perfection. I shake my head in admiration every time I watch. This movie is one of the best reasons to own surround sound. When the vibration shakes the water in the cup, you feel the bass, and the T-Rex breathing down your neck. More fun with Indy. I really didn't think he needed a kid's help but I am sure kids ate it up. 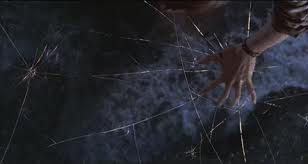 The beauty and the genius of the opening sequence impresses me every time I watch it. I loved the ingenuity of the inflated raft escape. 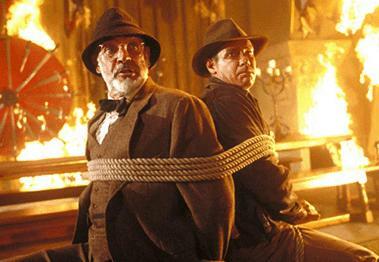 It was pretty intense when they sacrificed that poor slob (his flaming heart at right) and OMG Indy, snap out of it! Near the end I was thinking how people would love this move to be a theme park ride where they take that railway car through the mine. Steven Spielberg detractors can say whatever they want, I think he's got an overdeveloped sense of fun and I'm just glad he shared it with the world. How loved is this movie? Toy rule: they don't make toys for the movies no one likes. 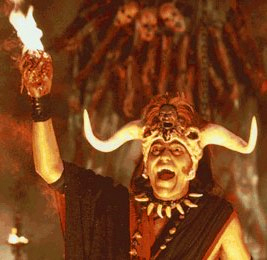 Aw, cute little baby Mola Ram (Amrish Puri) LOL so sick! Harrison Ford and Sean Connery. Who else could play Indiana Jones' Dad if not James Bond? I thought it was kind of gross they both slept with the same girl though. Doesn't seem to bother the male fans. 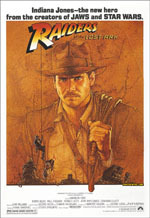 (This seems to be most fans' favorite Indy movie, but Raiders is mine). The banter between father and son is enjoyable and Sean Connery seems to be having a great time with it. 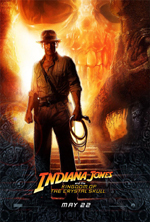 Watching it again at the Movie Marathon in Sept. 2012, I thought the tank chase scene with Indiana on horseback was about as good as it gets. When they blow up a troop transport full of Nazi soldiers at close range with the tank gun, it was Rambo-esque! The best part of these movies is message. This one in particular is poignant because he's a treasure hunter and it's a lesson about greed. Loved the mix of eras (World War II and The Crusades). As always, it delivers in exotic locations as well. Brendan Fraser on his seeming signature fine line between handsome leading man and big goof. In this movie, he teetered into leading man status. 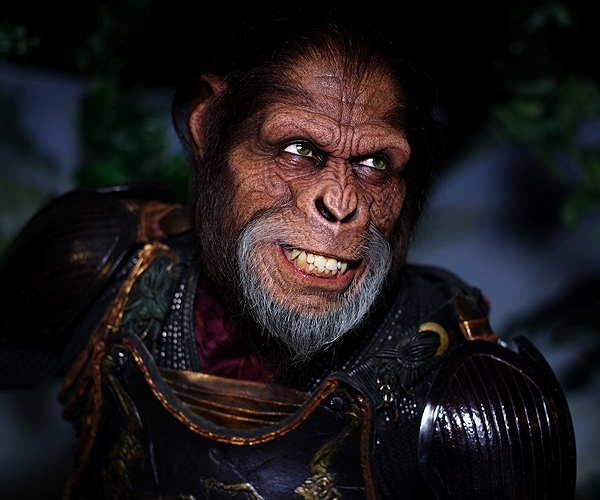 He was beautiful to look at [� la George of the Jungle but at some point between Bedazzled and The Mummy Returns (was it Monkey Bone?!) he seemed to get sillier]. In this, I really liked him. 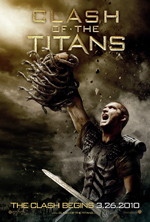 The special effects are visually creative and a huge part of the movie, and with Oded Fehr and Arnold Vosloo as man candy, it's over the top. For the guys, Patricia Velasquez and Rachel Weisz are gorgeous in costume. 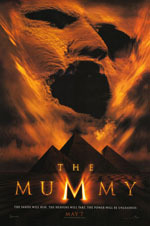 Ancient Egypt and archaeology movies are fascinating to many of us. 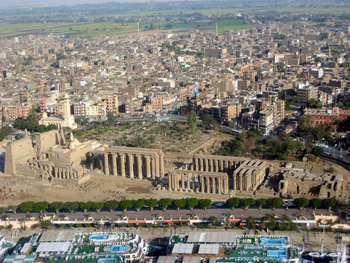 The opening sequence of ancient Egypt is beautifully brought to life with a pyramid in the background* and the sphinx in the foreground. As only video can do this justice, here is the opening of the movie next to the real-life, present-day site. So take the first movie and add Dwayne "The Rock" Johnson and Adewale Akinnuoye-Agbaje. Please sir, can I have some more? 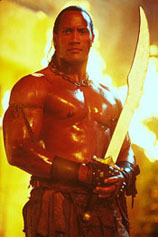 It worked so well, they made The Scorpion King as a spin off. So, all I'm talking about is who is in it. And that's why we enjoyed it so much! Loved the catfight, but while the women moved with practice, they did not move with intent. Still , always enjoyable. This movie is still entertaining every time I watch it for the dynamic of the characters if not everything else. It reminds me of why everyone liked the TV show "Lost". They wander around in the jungle and are incredibly stupid. This movie appeals to our interests in archaeology, paleontology, exploration, genetics, and you know you were just waiting for it, it has . . . Pterodactyls! The movie is a study in persistence and bravery. While the special effects seem a bit unreal at times, most times they are flawless. Nothing detracts from your enjoyment of the events happening onscreen. 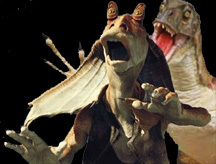 You still squirm in your seat and root for the characters to hurry up and not get eaten! The scene at right is movie magic, and I'm happy that I still marvel at what it must take to create a scene like this and make it look so real. 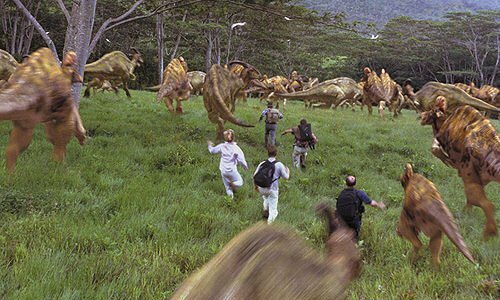 I'm also grateful for the creative imagination that knows this is one of our deepest, primal fears (the "moveable feast")—Like I said in the Adventure subgenre intro: "Run!" 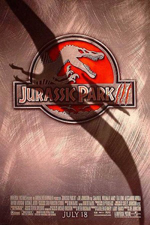 IMDBPro lists Jurassic Park IV for 2014, to be directed by Joe Johnston. The Walkabout movies aka Gorgeous Men with Long Hair movies. I liked parts of these movies, but I wanted more Action more often. It's like nitpicking an incredible meal just because you want more! 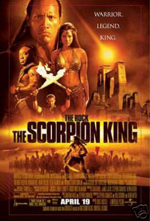 All Hail The Scorpion King! It's more than a little bit fairy-tale cheesy but it delivers for an Action Movie Freak, WAY BETTER than I had any reason to expect. It's just a Rock vehicle, right? No, it's so much more. The fight scenes are awesome, especially the one in the tent! From the even-a-girl-has-to-say-"Good-God! 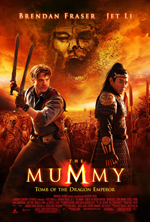 "-HOT Kelly Hu as The Sorceress, to the underappreciated scenes with the incredible wall of strength Michael Clarke Duncan, this movie is very entertaining, is always great to watch, and has a great ending :) It's like a really great brownie. It's not trying to be chocolate mousse. Eat your awesome! The Hobbit was my and a lot of other people's favorite book growing up, so, of course, I loved these movies. 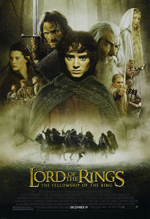 They are such big productions with great special effects, not to mention a great cast of gorgeous men, but keeping it true to the material made the structure a little dull. It was a "massive achievement" but I wanted more fight scenes and less hobbits walking. You know you were laughing when you watched that scene in Clerks II. 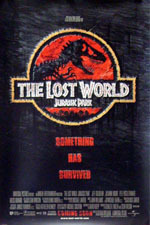 Sad to say, but my enthusiasm for these movies had completely cooled by the time I saw this one. I love Nicolas Cage in it. It's so much fun to unravel the mystery as we go. The opening action scene of the ship discovery under the ice is very 'Clive Cussler' (it beats me why more of those novels haven't been made into movies). This is the stuff we love Action Adventure for! 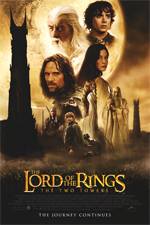 Sean Bean is enjoyable as a nemesis and gives a good Chase. The "treasure of all treasures" is ridonkulous! (A good thing but not believable, hence the "nearly perfect" rating). And, the humor makes this movie. It's great fun. In large part it's the script, but the fun is equally attributable to Justin Bartha who kinda qualifies as a Whiner, making the Camaraderie and Dominance/Buddy elements thoroughly enjoyable. Twenty minutes in there's a huge explosion and we know the set up: They have to stop 'the bad guy' from stealing The Declaration of Independence. It satisfied! And Adrien Brody and Jack Black didn't ruin it by being over the top. In fact, Jack Black was perfect in this role! It had that element of excitement about going on an adventure that the 1976 version had. I didn't mind the implausibility of the Action either, it was just THAT much fun! 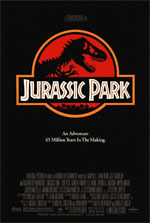 The kind of movie you want for a Saturday afternoon matinee; that makes you feel like a kid again. Such anticipation for this movie. I thought they handled him aging very well. I liked Shia LeBeouf. It was very Saturday matinee in the way that King Kong was. Not believable at all in parts (the Jeep sword fight) but enjoyable nonetheless. Hats off to Roberto/Robert Rodriguez (and to Alex Litvak, Michael Finch, Jim Thomas, and John Thomas) for even trying to do this. It had to be a daunting experience knowing expectations would be super high because the first movie is cult-classic popular. So, can you leave your love of Predator at the door, and still enjoy this movie? Yes you can! Adrien Brody is not Arnold (sigh), and yet he does do a good job. Can't believe I'm saying that, but I didn't hate him in this, and he held the movie through until the end. And, no, they did not kill him first, like I jokingly hoped (sort of). So what did Predators deliver on like the first movie? For starters, The Simple Setup: Let's "jump in" . . . The first Transformers was great, but the popular opinion of Transformers: Revenge of the Fallen was not favorable. This third installment makes up for it. I don't think anyone (well, any Action Movie Fans or Freaks) will gave a damn about the plot. There was so much 3-D action, my eyelids were fluttering like Nicolas Cage in Lord of War watching the ammo fly and hearing the sound of money! Cha-Ching! Cha-Ching! Cha-Ching! If you didn't go see it in IMAX, you missed out on probably the most amazing Action Movie sequence to date. Thanks to Michael Bay, the 3-D was JAW-DROPPING UN-BAY-LIEVABLE ! Watch more on Vimeo from MichaelBay.com. Read my article. I enjoyed it so much more than Avatar. It was fun to watch all the way through. I forgot there were special effects—when I wasn't being amazed by the whole the look of it! I wasn't pulled out of the fantasy even once. 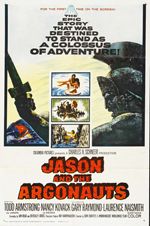 It's the kind of feel-good Saturday-afternoon Adventure film you hope to see. Loved Willem Dafoe in it! Taylor Kitsch was great too (love the 70s hair). In fact, everyone was really good. 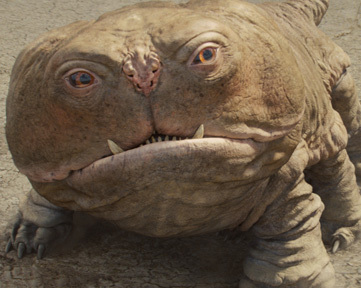 I liked the character of the Princess, but the 'dog' "Woola" stole our hearts. The costumes and sets were beautifully designed and creatively detailed. The ships, the weapons, and the planet . . . the whole thing gave me an original Star Trek TV series feel, like Capt. Kirk had been beamed down on a planet to fight strange creatures until the ship figured out how to get him back, but in the meantime he shows them how wise he is and saves everyone. That kind of good-feeling/fun. There are rumors about a sequel . . . Read more. 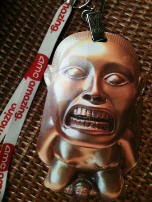 If you want a sequel, check out the Facebook page, and follow them on twitter: @JohnCarter2Fans and @BacktoBarsoom. On IMDB, John Carter: The Gods of Mars is now listed as "in development". Owch! Star Trek Into Darkness starts out with the same relational conflict and performance angst that the first movie did. And this movie, like the last one, does a stellar job of capturing the dynamic of the crew from the original TV Series. This is what we crave in Star Trek. The various characters are all brought to life in the same quirky ways: The supremely confident Captain, the infuriatingly logical and belligerent Science Officer, the mother-hen cantankerous Medical Officer, and the drama queen pull-a-rabbit-out-of-a-hat Engineer. They have their ways that get on each other's nerves, but they have mutual respect because are all incredibly good at what they do. Getting this right is essential because it's not Star Trek without it. ln a word, World War Z is an intense zombie movie. Not your typical zombie movie in the traditional vein in terms of an all-out gross-fest of gore (although the zombies are truly disgusting and terrifyingly fast and vicious), but more of an taut, emotional journey of the lead character to save the world. 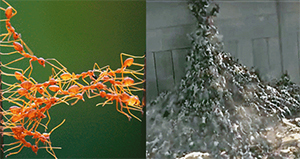 The movie opens with a surprisingly powerful video montage of various recent events, interspersed with images of animal and insect attacks and swarm behavior. It's a comment on the current human condition world wide. Being in Miami, I couldn't help but catch the attack on Ronald Poppo, sadly and tellingly listed on Wikipedia as the "Miami Cannibal Attack". The credits perfectly set the stage for the carnage to follow . . . Read more. Much of this movie hinges on the unrelenting viciousness of Tim Roth's character, "Thade". How much of being a glorified hero is the other side of the coin from a really 'good' villain . . . This movie builds and builds until that epic moment when the two groups face off, then, suddenly, the apes begin to run on all fours, fast. Surprisingly fast. Keeping ahead of horses fast. And the battle rages until . . .. . . Read more.